Edel Quinn dedicated her entire life to serve God through her commitment to establishing the Legion of Mary in Africa, which was proved successful despite the many challenges that came her way. Today, on her feast day, we remember the life of Edel and draw inspiration from her determination to spread the truth despite all odds. 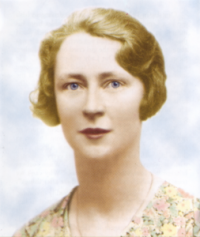 Edel Quinn was born in Kanturk, Co. Cork on September 14th, 1907 on the Feast of the Exaltation of the Cross. The cross was very much a part of Edel’s adult life. She was born of a very ordinary family. She was baptised in Castlemagner, Co. Cork. Growing up, she was a very bright child. Edel received her First Holy Communion in Cahir, Co. Tipperary on the Feast of the Ascension. Due to the nature of her father’s job as bank manager, the family moved around a lot, depending on wherever the bank determined her father was needed. When Edel was sixteen years old she was sent to Cheshire, England, to attend a finishing school for girls. 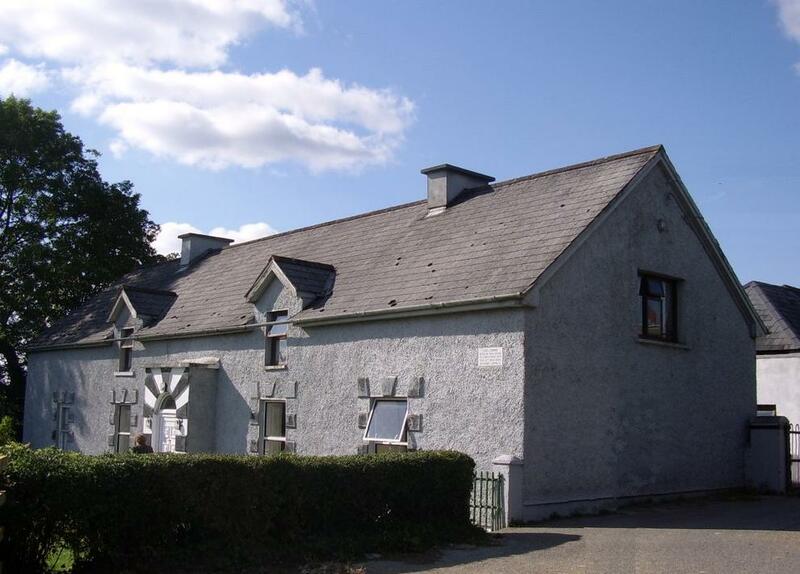 The house in which Edel was born, Kanturk, Co. Cork. Sadly, when she had finished her schooling, her father developed a gambling problem and was demoted to a lesser position at the bank, resulting in some financial difficulty for the family. Edel began working at the Chagny Tile Works in Dublin in an attempt to help the family get back on their feet. There, a young man called Pierre Landrin of the Tile Works took a strong liking to Edel. He was taken by her dedication and her ability to get things done efficiently. He could entrust the entire business to her knowing that she was more than capable of keeping everything under control. He proposed marriage to her on September 1st, 1927, when Edel was almost twenty years old. However, Edel rejected the proposal as she had already made a promise to enter the Poor Clare order of nuns as soon as her family were financially stable and no longer needed her help. Pierre admired her honesty and was greatly inspired by her strong faith. He later married another woman and gave one of his daughters the name Edel. In the early 1930s, Edel became very ill with Tuberculosis. It had been arranged that she would enter the Poor Clares on March 25th, 1932, on the Feast of the Annunciation. However, her illness was diagnosed a year before that and she was therefore unable to join. She was heartbroken and devastated as a result. She realised that God wasn’t calling her to the Poor Clares. He had another plan and Edel had to figure out what that was. Edel eventually became so ill that she was sent to Newcastle Sanitorium to recover from her disease. After spending a year there, she decided to leave. She had realised that her condition wasn’t improving and her family really couldn’t even afford her treatment. When she came home she became involved with the Legion of Mary, which she had previously been a member of before leaving for treatment in England. The Legion of Mary was a Catholic association of the lay faithful who serve the Church on a voluntary basis and was founded by Servant of God Frank Duff in Dublin in 1921. This is truly when she really found her calling. Despite being desperately sick, she went on the first Legion pilgrimage to Lourdes in 1934. Two years later, she traveled to England with another legionary, Muriel Wailes, on a mission to spread the Legion. While the initial week was challenging, within two weeks she and Muriel managed to get permission to start seven praesidia in North Wales. Upon her arrival home, Frank Duff, the founder of the Legion of Mary, suggested that she should go to Africa to spread the Legion over there and Edel immediately agreed. There was a lot of conflict at the time surrounding whether it was a good idea for Edel to go to Africa considering she was not in good health. However, permission was granted and she was eventually allowed to go. Edel was extremely committed to this cause. When she was leaving she told her fellow legionaries that she wasn’t coming back. She was willing to dedicate her entire life to the Legion in Africa. She first arrived in Mombasa on November 23rd, 1936 and began her work in Kenya, Nairobi. She faced many challenges while trying to set up the Legion of Mary in Africa. Firstly, there was the language barrier. Also, having people come together proved extremely difficult as people of different races and ethnicities didn’t mix with one another. Edel tried to explain that the Legion was for everybody. Eventually, Edel succeeded in establishing mixed praesidia, breaking new ground that no other missionaries could break. Shen had phenomenal success and continued to spread the Legion throughout most of East Africa. It was in her living the way of the Legion that people admired and were drawn to. Between 1936 and 1940 she spent her time traveling around Africa, continuing to establish the Legion in new place after new place. In 1940 her health greatly declined and she was forced to spend a year in various hospitals trying to recover. At the time of her mission, it was unheard of for a young woman who wasn’t a religious to travel around Africa as a missionary and so she endured her fair share of opposition. Edel died on May 12th, 1944, when she was just thirty seven years old. She is buried in the Missionaries Cemetery, Nairobi, among other missionaries and clothed in a habit of the Sisters of the Precious Blood. She most certainly replicated the life of the sisters in her total surrender to God by giving her entire life to carrying out his service. 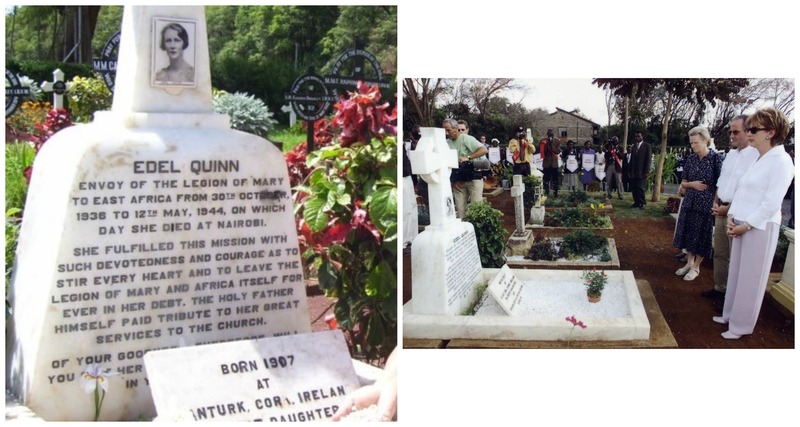 Left: Edel’s tombstone in Nairobi, Kenya. Right: President McAleese visiting Edel Quinn’s grave in 2001. Edel had a tremendous faith in God and a strong devotion to Our Lady. Throughout her life she did outstanding apostolic work. Her cause was introduced in 1963 and she was declared venerable in 1994. In her life she often said, “I could assist at the Mass the whole day long.” She had such a love for the Mass. When she was young, she used to attend as many Masses as she could on a Sunday. During her working life she would attend Mass every day before work. There were many favours received through the intercession of Venerable Edel Quinn, such as a seriously ill man restored to health in Uganda, a lady in Scotland with a debilitating backache who was totally cured, a man recovered from post-war syndrome in the U.S., and a college student in Ireland suffering from depression who ended up coming top of her class. 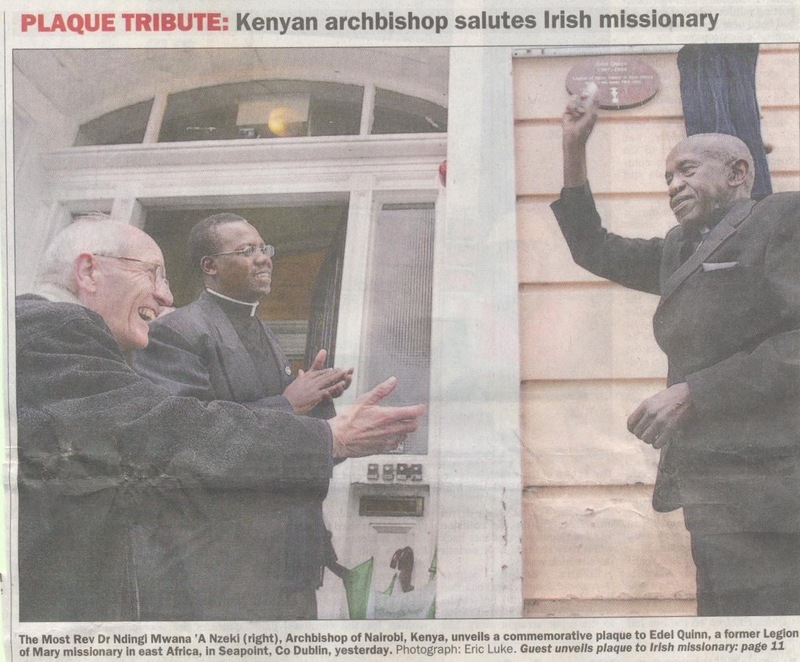 Today, there is a shrine to Edel Quinn in Castlemagner which the Archbishop of Nairobi(Archbishop Ndingi) visited in 2007, celebrating Mass there to commemorate the great work that she had done in Africa in the last eight years of her life. 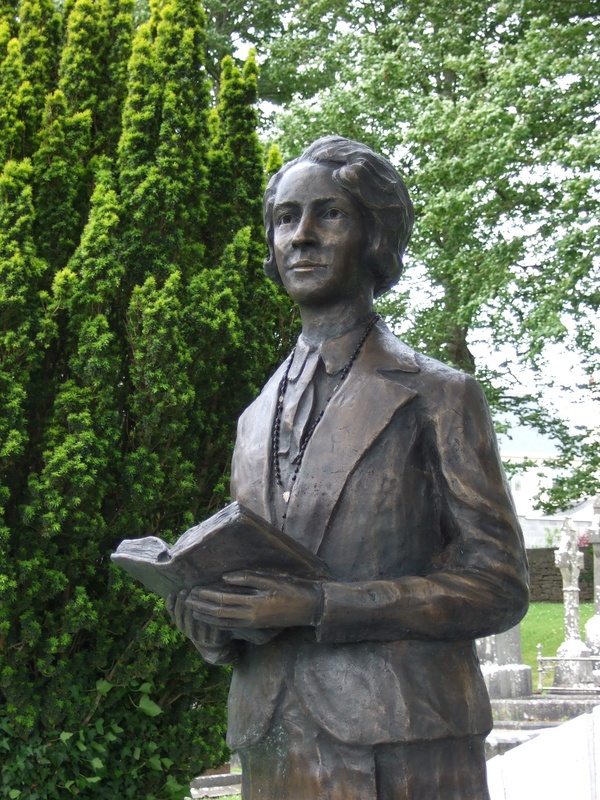 There is also a beautiful statue of Edel in Edel Place, Kanturk, and a nine day novena of Masses is said there in honour of Edel asking for her intercession. Throughout her life, Edel always had a servant’s heart and a great love for others. She would often visit the cancer wards in hospitals. In loving dependence on Mary, Mother of the Church. I place my petition in the hands of Mary to whom Edel turned to in every need. LEGION OF MARY Praesidia in the Diocese of Cloyne: Click here for list. This article was written by Ashlee Foley and is based on a video series by Fr Eamonn McCarthy (C.C. Macroom). This video series can be seen on Youtube by following this link. For more information on the life and work of Edel Quinn, you can also read Fr Eamonn’s article for Pobal Dé here (This link takes you to the Legion of Mary website).